In this series we explain the meanings of words unique to Japan. Today we will be introducing the "kagami mochi". We explain how to display it in your home, in order to attract good luck and happiness in the new year. Kagami mochi is a mochi (glutinous rice cake) offered to the deity worshiped and welcomed at the beginning of the year, Toshigami-sama. This offering is usually readied at the end of the previous year. The tradition of displaying kagami-mochi is said to have begun during the 14th century. 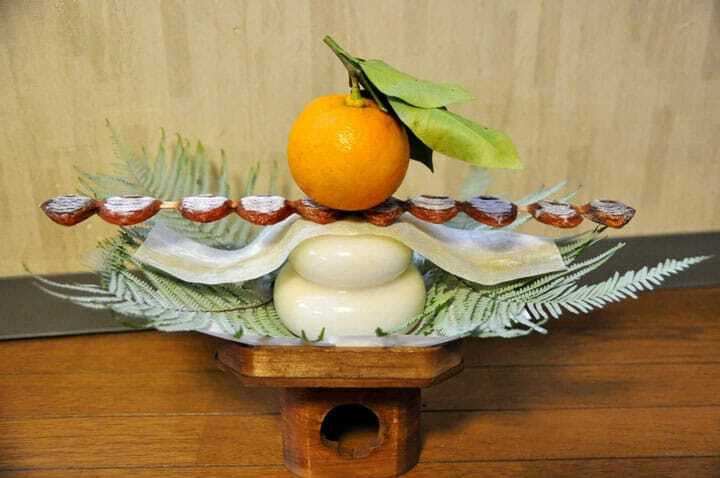 Kagami mochi is generally displayed with two layers of flattened mochi cakes, with a daidai fruit, which is somewhat larger than a mandarin orange, on top. Depending on the area, the mochi are decorated with dried kelp, umeboshi (pickled ume fruit), or sometimes even delicacies from the mountains or seas, like shrimp. The kagami mochi are placed on a stand called a sanbō (or sanpō 三宝 ), but if you don't have one you can just use a tray. The daidai is used because once a tree bears daidai fruit, it doesn't drop for 2 or 3 years. For this reason, this fruit represents chōju (long life). However, if you don't have one of these either, you can use a mandarin orange. A kagami mochi is displayed from the year end until the new year. You put it away on the day of kagami biraki, January 11. On this day, you crack the cakes into small pieces and eat them as zōni (a new year soup made with mochi and vegetables, but the recipe varies depending on the area). The mochi cakes can also be served as shiruko (a sweet red-bean soup dessert with mochi). In recent years, you can find kagami mochi products already cut up, sold in a kagami mochi-shaped case, which makes it easier to do "kagami biraki".